There are lots of reasons that you may be considering adding decorative stone to the landscaping around your home. There are lots of reasons that you may be considering adding decorative stone to the landscaping around your home. Perhaps you are adding a pathway from the front around to the back, perhaps you need to cover a bare area that doesn’t have any plants. Whatever the reason, these tips can help you with the task of laying the decorative stones. The reason you are adding the stones will play a large part in your choice of stone. If you’re making a path you will likely want large, flat rocks that people can easily walk on. Or you might need very small gravel-like pieces that can pack down into a path. If drainage is a concern, either river rocks or lava rocks could be a good bet because they provide good drainage. If you only need decorative stones for ornamental reasons, almost any stone will do as long as you like how it looks. As long as you know why you want the stone, a professional can help you choose the right stone to meet your needs. The size of the stone will determine the depth needed for the stone bed, which will, in turn, determine how much stone you need. Stones that average less than ½ inch in diameter need a 2-inch deep bed, stones with an average diameter of 1 inch require a 3-inch deep bed, and stones of 1-2 inch diameters require a 4-inch bed. Once you know how deep the bed needs to be, measure the area to determine how many cubic yards of stone you need. Keep in mind that a cubic yard of stones will usually cover 160 square feet at 2-inch depth, 108 square feet at 3-inch depth, and 80 square feet at 4-inch depth. 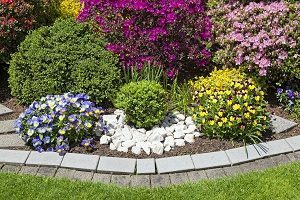 Before you can install the stone, you have to prepare the area: clean out the debris, dig up and remove any sod, and treat for weeds if necessary. Lay down landscaping fabric, and line the area with edging to keep the stones in place. This entry was posted on Friday, November 30th, 2018 at 9:59 am. Both comments and pings are currently closed.